Hear My Voice: This 1885 disc contains the only known recording of Alexander Graham Bell’s voice. In 1880, Alexander Graham Bell decided to go head-to-head with Thomas Edison. His goal: improving—and commercializing—the phonograph. Bell established the Volta Laboratory in Washington, D.C., using prize money he’d received from the French government for his invention of the telephone. He hired his cousin, chemist Chichester Bell, and instrument maker Charles Sumner Tainter. Collectively known as the Volta Laboratory Associates, the three men spent the next five years researching the transmission and recording of sound. Thomas Edison had invented the phonograph in 1877, successfully demonstrating how to record and play back sound. But there were problems. Edison’s machine recorded onto a thin piece of tinfoil wrapped around a cylinder. The foil tore easily, the grooves wore smooth after only a few plays, and the sound quality was poor. In short, nothing about the phonograph was practical. Bell saw an opportunity. 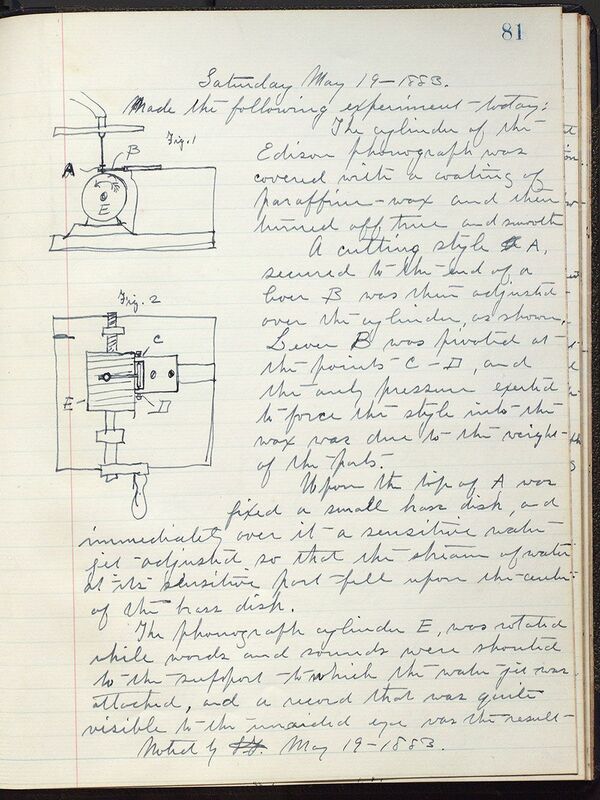 Sound Trials: A notebook belonging to Charles Sumner Tainter, a colleague of Bell’s, describes sound experiments at the Volta Laboratory, in Washington, D.C.
By 1885, the Volta Associates had applied for several patents for engraving sound on wax discs. They trademarked the name Graphophone to distinguish their product from Edison’s, and in early 1886 they incorporated the Volta Graphophone Co. to handle the commercial enterprises. One of their most successful products was the Dictaphone. Bell knew there was a distinct possibility of a patent fight with Edison, so on three occasions he had papers and experimental products sealed in tin boxes and deposited at the Smithsonian Institution for safekeeping. They were to be opened only with the approval of at least two of the three Volta Associates. Although Bell never used the material as evidence in a legal battle, the Smithsonian collection grew to include hundreds of sound recordings and notebooks from the Volta lab. These days, the Smithsonian, like many other museums, has to carefully balance the preservation of its collections with its ongoing research. Generally speaking, it’s not a good idea to destroy unique museum objects while on the quest for new knowledge, or to halt all research so as to preserve more objects. Most of the Volta recordings at the Smithsonian are one of a kind. They cannot be played, either because the original playback apparatus no longer exists or because to do so would permanently damage the record. For years, curators thought they had lost this sonic cultural heritage forever, and the objects sat mutely in storage. Echoes of the Past: Carl Haber [top], a physicist at Lawrence Berkeley National Laboratory, analyzes a scan of one of the Volta Laboratory recordings. Haber and his colleagues developed the scanning system, called IRENE [bottom], to recover sound from old, damaged media. [PDF] describing a method for digitally imaging the grooves of a record and then processing the image to re-create the sound. The two researchers prototyped it on a 1950s copy of “Goodnight Irene” by The Weavers, giving rise to their system’s name, IRENE (for Image, Reconstruct, Erase Noise, Etc.). Then they tested IRENE on a 1920s Edison wax cylinder [PDF], thereby proving that they had developed a noninvasive technique that could recapture sound from early original recordings. Curator Carlene Stephens at the National Museum of American History took notice. Could the IRENE team recover sound from the Volta recordings? Working with Peter Alyea, a digital conversion specialist at the Library of Congress, as well as Haber and fellow Berkeley scientist Earl Cornell, Stephens selected six Volta recordings deemed the most likely to reveal sound. Each recording also had a place in the history of technology. Throughout the 1880s, the Volta Associates were experimenting with different media and recording devices, trying to find the combination that would produce the best and most reliable sound quality. One example involved focusing a beam of light, projected through a liquid, onto a prepared photographic glass plate, which was described in U.S. Patent 341,213. Another used wax, dyed a bright green and poured on a brass disc. Yet another combined foil, plaster, and cardboard. Each object represented an experiment along the road to the creation of a standardized mechanical recording. 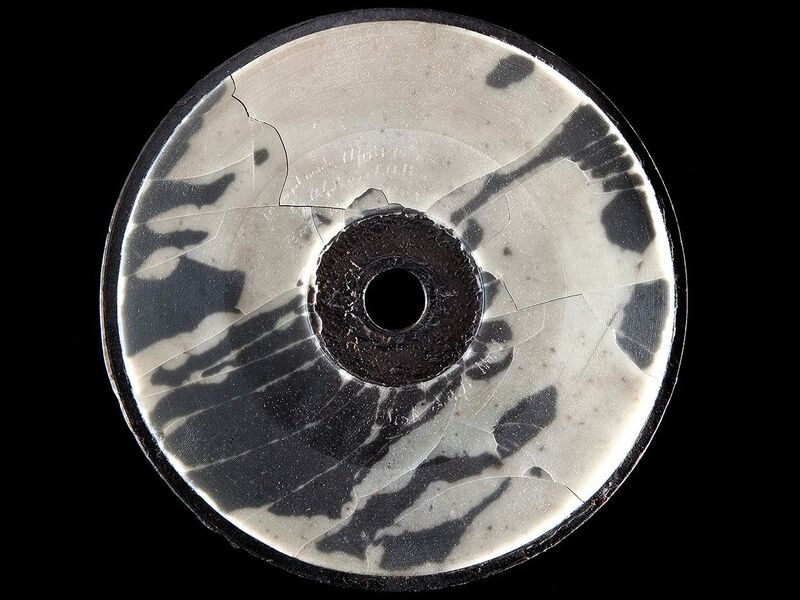 Recalled to Life: The IRENE system was able to recover sound even from damaged samples, including this cardboard, plaster, and foil disc from 1881. So what was the Volta Laboratory’s audio legacy? Bell thought that the most commercially viable application would be for business—a machine for either taking dictation or recording telephone conversations. The recordings also capture Bell’s family background in elocution (his father, grandfather, and brother all taught the subject). Most of the recently recovered recordings focused on clarity of speech. The Volta Associates can be heard counting, trilling the letter R, and reciting Shakespeare. They even cracked a few jokes: “I am a graphophone, and my mother was a phonograph.” Only one recording from the sample was musical. The collaboration to reconstruct the Volta Laboratory recordings shows the power of technology in pursuit of historical research. The challenge, of course, is making sure that the people who have the specific knowledge—whether it’s the technological know-how or the historical perspective—find each other. Before launching IRENE, Haber had worked as an experimental particle physicist, and his expertise included using optical metrology to align the silicon detectors of the collision chamber at CERN (the European Organization for Nuclear Research). After hearing a radio program about the disintegrating audio collections in museums, he decided to try to apply the same technology to optically scan the grooves of the historic recordings. Perhaps your own work could be applied to preserving cultural heritage—think about it. , by Leslie J. Newville, available in digital form from Project Gutenberg. looking at photographs of historical artifacts that embrace the boundless potential of technology.